Our Strawberry Mango Smoothie has spring and summer written all over it, from its light, refreshing taste to its beautifully vibrant colors. While this smoothie is both healthy and delicious, another wonderful thing about it is that it can be made two ways! For a super quick version, combine all ingredients together in a blender and you’re done. 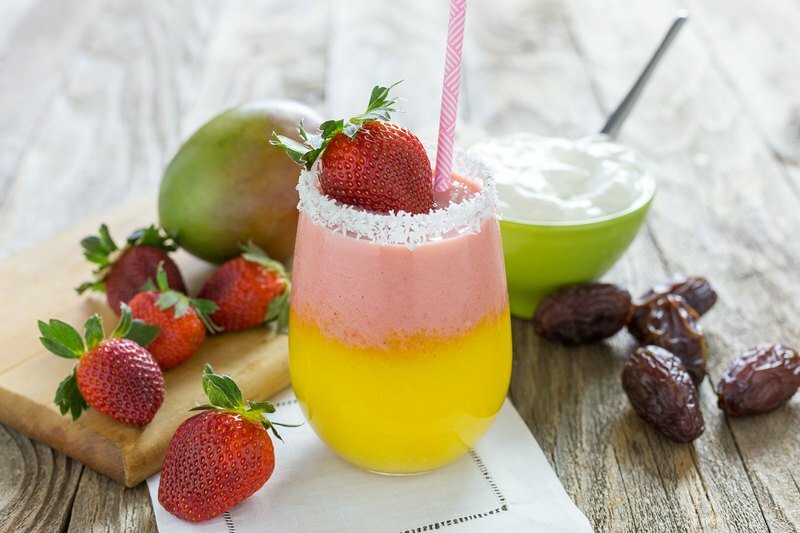 But if you’re looking to make the presentation extra special, whether for your own enjoyment or for someone special, it can also be made with two layers to showcase the delicate pink color of the strawberries and the bright orange color of the mango and orange juice. Either way you decide to prepare it, this is one recipe we think you’ll be making again and again! When you do, feel free to share it with family and friends on Facebook, Pinterest, Instagram and Twitter. This recipe makes two servings, for which you’ll need 1 cup of orange juice, ¼ cup of Cabot Lowfat Greek Yogurt, 1¼ cup fresh mango (cubed), and 3 Medjool dates (pitted and chopped). Simply put everything together in a blender, in the order listed, and blend until smooth for a smoothie that’s fast and easy to make. If you’re going for the layered look, you’ll first blend the orange juice and mango together and pour that mixture to fill your glasses halfway (be sure to use clear glasses to see the gorgeous layering, as pictured). Then rinse your blender out and blend all remaining ingredients together. Slowly pour the strawberry mixture on top of the mango layer. Garnish with shredded coconut and fresh berries, if desired. If you enjoyed this recipe, be sure to try our Strawberry Smoothie recipe. As a cooperative of over 800 farm families, we’re dedicated to creating the highest quality products and our recipes wonderfully showcase the fresh flavors of our products. Please share your thoughts about our Strawberry Mango Smoothie with us after you’ve tried it by rating and reviewing it. ADD all ingredients, except garnish, to a blender in the order listed. Blitz for 3-5 minutes or until smooth. For layered smoothie, blend orange juice with mango first. Fill bottom of glass. BLEND remaining ingredients and pour slowly over mango mixture. GARNISH by moistening rim of glass and dipping in finely shredded coconut. Top with a fresh berry. 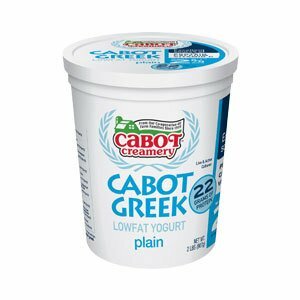 Mangoes are a favorite in our household and we always buy Cabot's Greek Yogurt. This recipe was delicious and super fun to serve!